Due to the development of internet, optical communications is in an urgent need to explore methods and technologies that can handle optical signals without expensive optical devices. The size reduction of optical devices in order to facilitate large-scale integration and the cost reduction are the bottleneck to overcome. Applying photonic crystals to produce integrated optoelectronic devices for communication is feasible with integrated circuit processes, therefore, the cost in production of such devices is greatly reduced. This is beneficial to all the user in bandwidth. New business opportunity is thus formed to further change the communications means and life quality of human beings. The theoretical analysis and design technology are establishing for photonic crystal and holey new fiber at present. Meanwhile, the production and property measurement for quantum dot laser diode are underway. 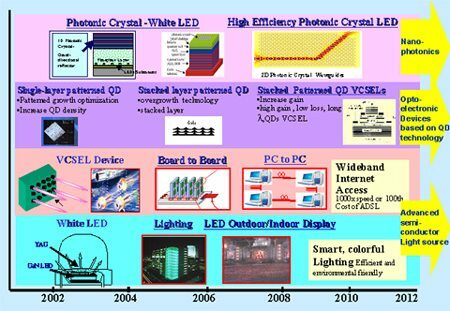 Evaluation on the effect of photonic crystal structure and quantum dot structure on performance improvement for optoelectronic devices like LED and LD and on the best approach for future R&D have been completed. Establish the theoretical analytical ability for Photonic Crystal Structure. Develop nanooptical device technology and establish the design basis for the key optoelectronic devices and system for the next generation. Build the theoretical analytical ability for nanooptical devices. Develop Nano Jet technology and establish the design basis for the key optoelectronic and electronic devices and system for the next generation.